My Sweet Prairie Studio / Art by Monika Kinner-Whalen: Fun in the Mail & a Giveaway! Fun in the Mail & a Giveaway! Wow - I sure got lots in my mailbox this week! I got more accu-quilt samples from Sandie in Alberta. (Thank you!!) She also sent along the tree fabric I needed for Mandy's wallhanging, which is terrific. 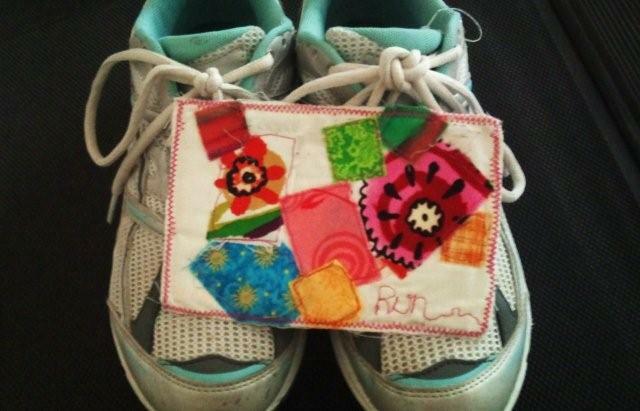 I got a postcard from my inspire-me-to-run buddy, Christie. : ) Here is the lovely card posing sweetly with my running shoes. I love it! My new cards came in too. They turned out pretty great. I'll have them with my work on display next week. 7 days left! At first I thought, "Oh come on. It's just another glue stick". I'm not picky. I use my kid's acid free nontoxic school glue sticks all the time in my sewing room. It's really handy for my art. I stick fabrics in place when I collage backgrounds. I don't need hot irons for fusibles. It's pretty handy. You know how I hate pinning. But I prefer this new product! It's really smooth and applies like lipstick. It dries really fast and won't gum up your machine. It's temporary and non staining. All good. I think it's better than what I usually use because it's not gunky and sticky and lumpy like school glue sticks. This stuff applies to fabric without pulling and stretching it out of shape. I also like it better than wet glues because they seem to soak into the fabrics and they dry very stiff. This stays flexible. pieces glued into place before thread painting. What else can I tell you? It's a Canadian product, out of British Columbia. I should add that it's a "do good" glue. This company is involved in a lot of fundraising ventures with this product, including a huge percentage of sales going to Junior Diabetes Research Foundation. Diabetes affectes my husband, cousin, father in law... hopefully never my children too. I used it again today to stick a quilt label on prior to hand stitching it. It's VERY nice to not have to use heat. Tell me how you would use it and why you think you would like it. I will pick two winners by midnight on Tuesday the 23rd. Good luck! Also, if you are interested, Sunshower Quilts is having another giveaway - it's for the Accuquilt Go Baby machine! go check it out. She's Katrina in Ontario. Oh glue stick I would use you to help keep things in place while I try to get my silly fingers to obey my commands. I have a project just itching to try you out ;). Is that what you mean Monika? I've never used a glue stick for quilting. Looks like a wonderful project though. I hope you don't mind....I've posted about where to send quilts for Japan on my blog. I'll be making a couple to send to them. What a wonderful way to help. I'd love to get anything from you Monika!! I've never tried glue with my sewing endeavors! I'd love to give it a try!! Thanks for the info! Super! I'd like to try the glue stick. Like you I hate pinning. So first off I'd want to make fibre art. Then it is Canadian. whoo hoo. So tired of trying to find stuff from across the line. WHOO HOO! too! Okay... I was just thinking about trying this and then you said the 'magic' words: fund-raising and Juvenile Diabetes (it killed my husband in 2006 after 47 years of living with it. The last 10 were NOT pretty.) Now I know I have to use this product for my pre-stitch layering! I do spray baste my quilts when quilting and have occasionally used a glue stick for applique but mostly I haven't used a glue stick. Sounds interesting Monika. I would use it when doing my art quilts. Wow, that sounds fabulous - I'd love to have some for paper-piecing, as well as applique and labels. Well, now that I'm going over to the dark side with the fusible web anyway, that glue stick sounds like the next logical step!! Right? Pick me! Please! I've just heard about this product recently. I wondered if it's really different from regular glue stick. I've been wanting to make fabric post cards. I would use it to hold all the small pieces together. I love that they donate towards diabetes! 3 of my husbands siblings have diabetes.